Photography is a word having Greek roots, which basically means "drawing with light". When I started doing digital photography a few years ago, this did not make sense to me at all. How can you make a picture just using light? Only light matters? My pictures were either black or completely washed out all the time, but I didn't feel like giving up. It took me a fair amount of time to understand controls such as shutter speed, aperture and ISO which was the outcome of non-stop reading and a lot of mistakes. Coming back to the concept of light, it started to make sense after attending a film photography workshop. The dark room with very dim or near to zero red lights was a whole new point of interest. My partner and I made a pinhole camera out of a pumpkin. The workshop made me understand how important light is when taking pictures, and the rules apply to both film and digital photography. 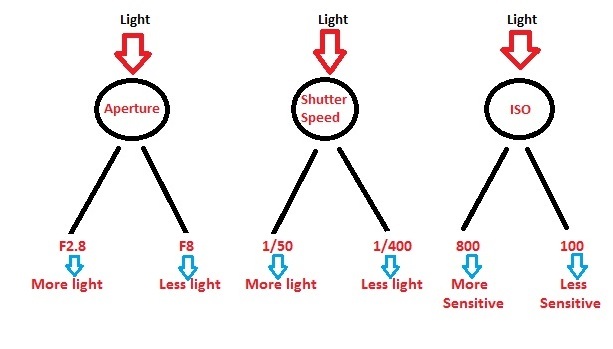 Basically, the value of shutter speed and aperture directly affect the amount of light that hits the sensor of a camera. ISO determines how sensitive your sensor is to that light entering. These three factors determine the overall exposure of your DSLR photos and ultimately how bright your images will look. The light entering camera gets transformed into an image by a combination of electronic circuitry. 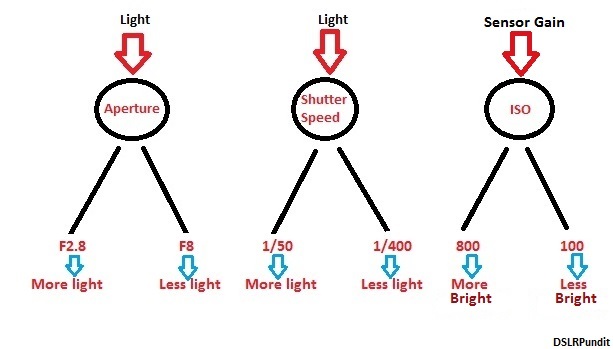 A short and crisp way of explaining the light variation whenever one of these values is changed on a digital camera is shown below. 1) Sunset landscape shot: Slower shutter speed for more light, high f-stop for more details (depth of field). Yes, high f-stop would minimize the light, but slower shutter speed would cover up for it. 2) Bike racer or other moving objects: Faster shutter speed to freeze action. F-stop as low as possible to make the background out of focus. If the image is blown out(too white), then the only solution is to increase f-stop so as to control the incoming light. Quick tip: When to vary ISO? Well, depends on the situation. Example: A dancer inside a low light room. If the lowest feasible shutter speed (to freeze action) and lowest f-stop are not able to provide properly exposed shot (hard to see dancer's face), then ISO becomes a lifesaver. This concept of learning when to vary what comes with practice and time.